Come with six kit options with varying 12V pumps and either automatic or manual fuel nozzles are available. Ideal for industry, mining and agriculture. 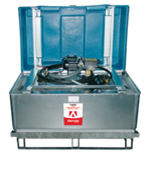 Consists of an internal HDPE tank surrounded by an integrated galvanised sheet steel bund. Suitable storage of fresh oil, waste oil and diesel fuel. 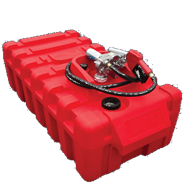 Extremely durable fluid storage tanks. Available in various sizes. Suitable for truck, ute or yard. Integrated sheet steel collection tray. Complete with 12V, 50LPM pump with automatic nozzle and 4m filling hose. Flowmeter for the electric pump. Equipped with an optical leakage detector.